1. Reversible Magnetic Adsorption design, can be inserted in both directions. 4. Magnetic automatic adsorption, even in the darkness, you still can charge your phone easily. 6. Pure copper wire, provide fast charging and high speed data transfer. 7. Charge indicator, so you can easily find in the dark. 8. Durable wire,10000 times bend test. 9. Not only charge, it support data transfer in one side. 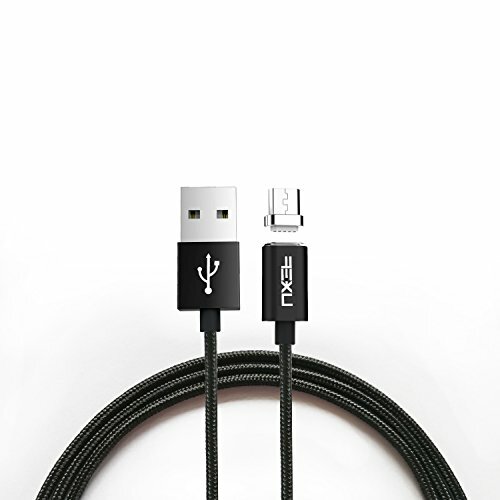 SAFE CHARGING & SYNCING: iKNOWTECH Magnetic Micro USB Cable, Nylon Braided Data Charger Charging Lead with Metal Plug LED Indicator Light for for HTC One M9 M8 A9 / LG G4 G3 G2 G Flex/ Motorola Moto G G4 Plus / BLU Studio G HD LTE / Vodafone Smart First 7 / Wileyfox Swift 4G / Amazon / Bluetooth Speaker / Headphone / Power Bank / Android Smartphone Tablet and More (1.2m / 4ft) Note: Not supporting fast charging! DURABLE NYLON BRAIDED CORD: NO VIOLENCE PLUGGED. Thanks to compact design and application of poles aligned, the ends of the interface can automatically adsorb. With one hand can done to reduce physical damage to the charging port. Test 30000 times, magnetic design make your charging more simple. EXTRA STRONG DURABLE & CONVENIENCE: STRONG MAGNETISM NOT EASY TO FALL OFF. Using imported NdFeB magnet as materials with strong magnetism, not easy to fall off when it is charging. In the process of using to reduce the damage of pull cable violently. ULTRA DURABLE & LIFE TIME WARRANTY: MINIATURE CHARGING MAGNETIC PLUG DESIGN. Dust plug design, smaller size, lighter weight, 24K gold contacts make electricial conductivity better, insulation PET cover, compatible with most of slim phone case.